Why me!!! It appears that i’m a magnet to sociopaths to the degree I have lost all trust in people and spend the majority of my time alone. I have really suffered at the hands of these evil creatures. Not only mental abuse but my health is also in tatters. In 2005 I met a charming man who worked within the care industry, he was in the choir and appeared to be held in high regard within society. I’m not afraid to take responsibility for making bad choices but it became evident that i was manipulated in to making those choices. A sexual relationship with this man soon developed and based on his believable reasons no protection was used. Four months into the relationship I fell really ill and ended up in hospital. Many tests were run and it was discovered that I had throat cancer. I was devastated but got no support whatsoever from my partner, not even a visit in hospital. Whilst having to come to terms with being diagnosed with cancer my doctor informed me that the tests also showed serious inflammation of my liver. They questioned how much alcohol I drank but I dont drink so that was out the question. Up on reflection I asked the doctor to give me a full sexual health screen to rule hepatitis out. When the results came back I went in to shock, I was HIV positive, had Hepatitis B and to top it all I had syphilis. I truly believed my life was over. It all started to make sense why my partner wouldnt visit me in hospital. After a couple of weeks in hospital I was eventually allowed home to continue treatment as an outpatient. My partner was there to greet me, he said not to worry he still wanted me even if no one else would, under the circumstances I felt grateful. Both my parents have sadly passed and I have one sister of whom ive never had a close relationship with, and I didnt feel able to reach out for support from my friends due to the stigma attached to HIV so kept them at arms length and intern felt very isolated. Over the next few months things went from bad to worse, I wasnt working because of my health and intern I had a lot of time to reflect. To cut a long story short it became evident the man who claimed to love me had intentionally infected me with his infections and when I threatened to go to the police he attacked me with a knife, fortunately I only suffered minor injuries. I ran out the house and telephoned the police. When the police arrived I was outside in total fear of my life. They went in the house only to find him covered in blood! He’d cut himself with the knife a said I’d attacked him. They arrested us both and I spent the night in prison. I was released in the morning pending further inquiries, he was released later on that day and manipulated his way straight back in to my home. I was desperate for the police to help me but was left feeling like a bunny boiler, I felt more isolated than ever!! Why couldnt they see through his charm?! I was under the power of a sociopath, had no support, my health was in the gutter and I was at a point were I could quite easily have given up. By this time i’d done my homework and ended up learning all about his destructive behaviour and what he was, a sociopath! I’m not a doctor so couldnt go to the police and say my partner is a sociopath, help me I’m trapped. So i had to learn to play the game and get him out of my life. After being told on a daily basis I was suicidal and that if I went to the police he would get to me before they got to him and I would be found in a pool of blood he left me. I thought that I’d won the battle to get my life back but then the death threats started. Emails saying ‘hit and run soon’ etc. I was more vulnerable than ever but at least by this time the police started to listen. The police went to arrest him but couldnt trace him, he’d gone on the run! He left his home, car, job and family and hasnt been seen since. The police insisted I move house for my own safety, which I did. They installed panic buttons in my home and various other gadgets for my protection. Fortunately the death threats have since subsided but that doesnt mean that one day he wont raise his vile head again. This sociopath cost me My health, my life savings, my home and friends = my life. I can only hope and pray he doesnt come back and find me. 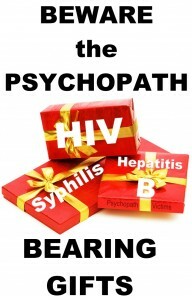 A year later in 2008 my health was under control, the cancer treatment had gone amazingly well, the syphilis treatment was 100% successful and I’d gone on meds and my HIV had become undetectable, however I still had Hepatitis B and the doctors said it was now unlikely I would clear it. I was just grateful to have my life back. 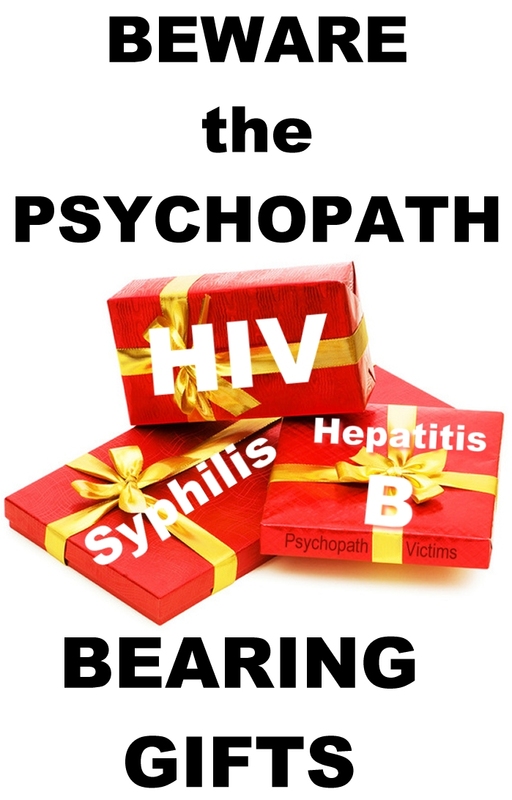 Author pathvictimsPosted on October 8, 2014 October 8, 2014 Categories Victim StoryTags cancer, hepatitis b, hiv, psychopath, sociopath, syphilis, victim5 Comments on Blood Drawn, STDs – Why Me?